NHL.com continues its preview of the 2014-15 season, which will include in-depth looks at all 30 teams throughout September. For more than four decades, the New York Islanders have called Nassau Veterans Memorial Coliseum home. The 2014-15 season will be their last at the outdated facility on Hempstead Turnpike; the Islanders will be moving into Barclays Center in Brooklyn next fall. And that's just one of several changes on the horizon. Team owner Charles Wang is in the process of entering into a new partnership. The Islanders announced Aug. 19 that a group led by former Washington Capitals co-owner Jon Ledecky and London-based investor Scott Malkin reached an agreement, subject to NHL approval, to purchase a substantial minority interest in the team. Under the terms of the agreement, Wang will continue as majority shareholder and governor of the Islanders, with the Ledecky/Malkin group transitioning to majority ownership in two years. After failing to qualify for the Stanley Cup Playoffs for the sixth time in seven seasons, changes were made to Jack Capuano's coaching staff. Assistant coach Brent Thompson is returning to the Bridgeport Sound Tigers to be the team's head coach. Greg Cronin, who has been an assistant with the Toronto Maple Leafs the past three seasons, was hired by the Islanders in the same capacity on June 16. This will be Cronin's second stint in New York; he was an Islanders assistant from 1999-2003. Cronin will be one of three assistant coaches, joining Doug Weight (who was also promoted to assistant general manager), Bob Corkum and Matt Bertani. Several changes were also made to the on-ice product. Goaltending, which was a major issue for the Islanders last season, has been addressed. New York acquired the rights to Jaroslav Halak from the Washington Capitals on May 1 and signed him to a four-year contract three weeks later. Halak will be joined by Chad Johnson, a more-than-capable backup. Looking to add more offense and alleviate some pressure from superstar captain John Tavares, the Islanders signed center Mikhail Grabovski and right wing Nikolai Kulemin on July 2. The two combined for 59 goals while playing on the same line in Toronto in 2010-11, and the hope is they will rekindle that magic in New York. 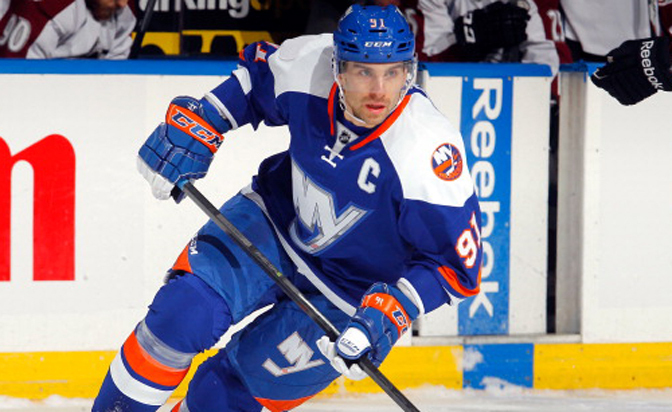 Tavares is healthy after a knee injury at the 2014 Sochi Olympics forced him to miss the remainder of last season. With the emergence of Kyle Okposo (69 points in 71 games), a more balanced offensive attack and improved goaltending, the pressure will be on general manager Garth Snow and the Islanders to find their way back to the postseason. "You play to win and you play to win the Stanley Cup," Tavares said. "That's been our goal, for a lot of us since we were kids to have that opportunity. After a great year we had during the lockout season we were really disappointed with it last year. This is a big year for us in a lot of ways. You can see Garth and management really trying to find that solution to get us into the playoffs and consistently have that. The pressure is great. You have to enjoy it. It just means there's a great opportunity ahead of you." The 2014-15 season is drawing closer by the day, so NHL.com has you covered with all the fantasy hockey advice you'll need on draft day. Below are New York Islanders players who qualified for NHL.com's top 275 fantasy list. Each player's aggregate spot was determined by averaging the individual rankings of Matt Cubeta, Pete Jensen and Matt Sitkoff. Also listed are each player's Yahoo position eligibility and any offseason NHL.com fantasy content that breaks down projected value for 2014-15. Tavares and Okposo clearly make up two-thirds of the top line, but the Islanders enter training camp with an open competition on the left wing. The belief is that Brock Nelson, a first-round pick (No. 30) at the 2010 NHL Draft who scored 14 goals as a rookie last season, will receive the first crack. Ryan Strome was taken fifth in 2011 and will also likely get a look because of New York's sudden abundance of offensive centers. The Islanders also used their first-round pick at the 2014 draft on a left wing, selecting Michael Dal Colle from the Oshawa Generals in the Ontario Hockey League. Dal Colle, 18, had 95 points (39 goals, 56 assists) in 67 games last season, but will likely be returned to the junior level for more seasoning. "We're going to try some things in preseason, there's no question," Capuano said. Grabovski and Kulemin are expected to skate on the second line, perhaps alongside Strome. The Islanders went 21-11-5 when Strome was in the lineup last season, and his ability to make plays could be an intriguing option for Capuano. Josh Bailey, who possesses plenty of skill but has yet to put it all together offensively at the NHL level, is another possibility. "Personally, I'm just happy [to] find a good team, and sign the long deal," Grabovski told the team website. "Then I can stay and just enjoy playing and relax. It's a great city, and it'll be a great chance to play next year in [the] new stadium." Grabovski's arrival allows Frans Nielsen to center the third line and makes the Islanders one of the deeper teams down the middle in the Metropolitan Division. Nielsen, 30, set career highs last season in goals (25), assists (33) and points (58). Some pundits believe the Islanders' blue line corps still isn't good enough to get them into the playoffs, but Calvin de Haan, a first-round pick (No. 12) in 2009, emerged last season and averaged 21:01 of ice time per game. Now that Andrew MacDonald is a member of the Philadelphia Flyers, de Haan will receive even more ice time this season as long as he continues to progress. He will likely be paired with the team's anchor on defense, Travis Hamonic. The 24-year-old averaged 25 minutes per game last season. It is crucial for the Islanders that Lubomir Visnovsky remains healthy. The 38-year-old was limited to 24 games last season because of a concussion, and his veteran leadership and ability to quarterback the power play were sorely missed. Visnovsky could be paired with Griffin Reinhart, provided the latter impresses enough in training camp to secure a roster spot. Reinhart, the Islanders' first-round pick (No. 4) in 2012, is coming off a Memorial Cup championship with the Edmonton Oil Kings in the Western Hockey League. The 6-foot-4, 217-pound defenseman is eager to begin his NHL career. "I want to show them I can play here," Reinhart said. "Not just fit in, but make an impact. I want to show them I can play at the pro level in the NHL first and [I'm going to] work really hard in practices to show them that I want to be here. I plan on doing the drills right, not taking any shortcuts and just doing things the right way." New York's third pairing will likely consist of Thomas Hickey, a waiver-wire acquisition in 2013 who continues to make strides, and T.J. Brennan, who signed as a free agent this summer. Brennan, 25, had 72 points (25 goals, 47 assists) in 76 games for the Toronto Marlies in the American Hockey League last season and provides insurance on the power play if Visnovsky is unable to stay healthy. New York simply didn't get the goaltending it needed to compete for a playoff spot last season, but Halak arrives armed with a four-year contract and eager to build off the success he had in nearly four seasons with the St. Louis Blues. In 40 games for St. Louis last season, Halak went 24-9-4 with a 2.23 goals-against average and .917 save percentage. He played a career-high 57 games for the Blues in 2010-11 and should expect a similar workload with the Islanders. Halak will be joined by another newcomer in Johnson. The 28-year-old had an outstanding season with the Boston Bruins as Tuukka Rask's backup; in 27 games, Johnson went 17-4-3 with a 2.10 goals-against average and .925 save percentage. "I've always said it's good to have two good goalies and really good competition between each other," Halak said shortly after arriving on Long Island a couple of weeks ago. "They push each other in practices and games. Obviously whoever plays better, that goalie should play. We'll see how it's going to work out, but obviously I'm going to do my best every day and every practice. "They have a young team and a great group of guys over here. They are only going to get better. I was glad that they traded for me and showed good interest in me. I'm happy to be here and thrilled about training camp and the start of the season."